Ah yes, today is February 29, the day we fulfill our leap year obligation. Of course this wacky date would coincide during a year where we have a presidential election, the summer Olympics, and, most importantly, a big wedding in June. No bones about it, 2016 is a huge year and we are somehow already two months into it. I appreciate that we continue to honor the occasional February 29 solely because of the poor people who were born on the date. Although I know most babies who entered the world on Leap Day will celebrate their birthdays on February 28 or March 1 on non-leap years, I can only imagine that it probably just isn’t the same. It sabotages the clean tracking of time. I am a concrete sequential person, meaning I like everything organized and quantitative. I love putting into perspective the passage of time. Believe me, I haven’t kept a journal for close to two decades nor checked Timehop on a daily basis for nothing. If possible, I would take the liberty to say “exactly five years ago today I learned to salsa dance” or “13 years ago today I aced my accounting test” but both examples are inaccurate (besides the fact that both events never happened in the first place). You see, the leap year negates a very common way of thinking. Let us say that yesterday (February 28, 2016) I won $1,000,000 dollars. On February, 28, 2017, I will not be able to say “exactly one year ago I won a lot of money.” Unfortunately, It is completely inaccurate to make that statement. The Leap Day screws this all up. A whole year, 365 days, would have passed on February 27. Let me give you another example of how messed up this is. Most would assume that when I celebrated my 29th birthday, I had lived 10,585 days (365 x 29). In reality, because of Leap Days, I had actually lived 10,592 days. It drives me bonkers! Each time we say something along the lines of “exactly 12 years ago this happened…” or “16 years ago today this occurred…” we are completely wrong. I hate it. Of course I am well-versed in how historians and others get around this messy problem. You simply say “on today’s date in 1986” or “back in 1979 on this date” etc. This is all fine and good but it doesn’t begin to address the fact that millions of people don’t think this way. Most will believe that February 29, 1988, happened exactly 28 years ago today. Not so. Maybe 28 years and a week ago, but not 28 years exactly. Now believe me, I know why we have leap years. They help hold our calendar together in other ways. I mean how else are we going to control the way the planet moves on its axis? However, the fact that it messes up the congruent passing of time in years bothers me. Then again, perhaps I should have more pressing and relevant problems keeping me up at night. Don’t Blink. Growing up, we had one major use for the comics section of the newspaper: When a friend had a birthday, my mom would take the last couple newspaper issues out of the recycling bin and wrap the gift in the colorful ink of the funnies. Who needs wrapping paper, right? 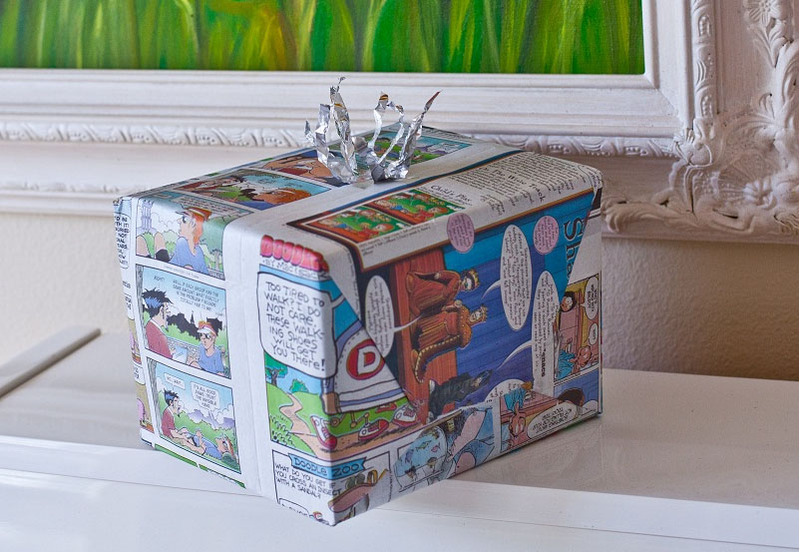 My mom would always wrap the birthday presents we gave to our friends in the comic sections of the newspaper. As a kid, starting around the time of third grade, I religiously read the paper every morning before school. However, the one section that usually appeals to children under the age of 12, the comics, never captured my interest. When I got to sixth grade and we had our newspaper unit, many of my classmates skipped right to the funnies. I am pretty sure I scoffed at them. I found the comics section not meeting my sophisticated standards. I was all about the hard stuff. With only so much time in the morning, I digested the national, local, sports, and entertainment sections of the paper before I had to catch the bus. I told myself I didn’t have time to flip the sports section over and read the brightly colored comic strips on the back. Besides, the times I did read the comics I never found them funny anyway. Years later, I would figure out that this was my problem. As time rolled on, I continued to shun the funnies section. By this time I was an adult and had no excuse to read them. Although I let my guard down a little and would start reading “Dennis the Menace” and “Family Circus” simply because they were each just a single captioned panel, I never took the time to read the other offerings. I mean seriously, Garfield and Charlie Brown are for kids. It didn’t matter where I was living and which newspaper I was reading, I would always become astonished at how passionate adults would get over their comics. A controversy from the funnies page would always spill over from the back of the paper where they belonged to the legitimate and highly serious editorial section. In the letters to the editor, I would read entry after entry from readers upset about either the comics going to black and white, a beloved comic strip being removed from the daily lineup, or a selection that caused a minor uproar by offending a few people. After years of reading these types of letters, I became vaguely aware that the comics section wasn’t just for kids. In the past few months I have started to find the humor in comics (this strip was from yesterday’s paper). A few months ago I had some time on my hands. With my electronic version of the paper still pulled up and without anything pressing that I needed to look up on Wikipedia, I decided to glance at the comics. My “quick glance” turned into a detailed reading of every single comic strip on that page. I wanted to see if I was in fact missing anything. Despite the belief I held for most of my life, I can now say that the comic section of a newspaper is probably more for ADULTS than for KIDS. For much of my childhood I neglected the funnies because they didn’t make me laugh. As I reached my adult years I held onto this reason for not giving the comics the time of day. But after reading them now on a daily basis I have to admit a sobering truth: The 11-year-old Brent just didn’t understand the jokes, ironies, and sarcasms embedded in those colorful strips. The comics section of a newspaper sheds light on the issues, occurrences, and problems faced by individuals. It touches on relationships, office life, health realities, the daily news, financial issues, political battles, pop culture, and so much more. If an average adult read the comics from top to bottom on any given day, he would most likely have a comprehensive outlook on what it is like to be a typical American. This commentary on everyday life is disguised in colorful ink with talking animals, cavemen, and characters with outlandish facial features. It is not Saturday morning cartoons like I once thought. Rather, it is a funny outlook on what it means to be a member of society. I didn’t understand this as a kid and I didn’t understand it for 10 years of my adult life. However, I am glad I utilized the free time I had a few months ago to give the comics page another look. The joke was on me. Don’t Blink. After attending a Marco Rubio rally and a Jeb Bush town hall last week, I had the opportunity to stroll on the other side of the fence last night. In company with an estimated 1,000 people, I watched the current superstar of the Democratic party state her case for the highest office in the country. After seeing Marco Rubio and Jeb Bush last week, I went and saw a Democratic nominee last night. 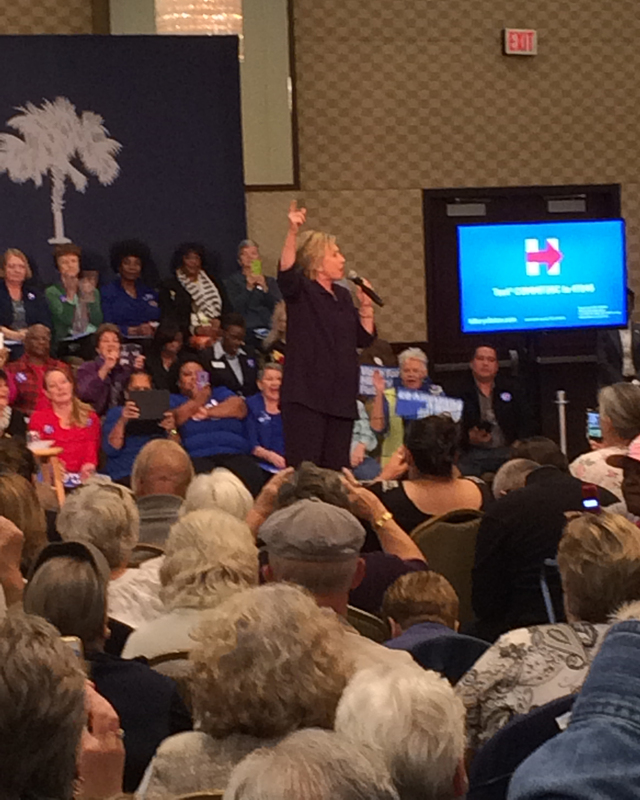 Hillary Clinton spoke at the Myrtle Beach Convention Center on Thursday night. Originally scheduled for 5 p.m., the event was pushed to 6 p.m. because a previous campaign stop of Clinton’s ran long. This provided me the perfect opportunity to get to the venue and watch the rally in its entirety. After waiting in line and getting frisked by the Secret Service, I entered the ballroom of the convention center. With all the seats taken, I stood in the back with the media. This panorama image was taken by a member of the local Myrtle Beach media right as I entered the venue. If you look to the very left you will see me with the gray and blue polo. I would push myself up directly behind the last row of chairs and enjoy a great view (photo courtesy of Meghan Miller of WBTW). Believe it or not, this was probably the best arrangement possible. Not only was I positioned directly across from where Hillary would deliver her stump, I was also able to see over the crowd since I was on my feet while everyone else was sitting down. The rally started with a five minute video introduction. Any guesses on who delivered it? Let’s be honest here, if your spouse was a former president you would have him/her introduce you as well. After Bill’s video, Hillary came out with a local Myrtle Beach politician (I apologize, I can’t remember the man’s name or title). This local elected official gave a brief one minute introduction. Secretary Clinton then took the mic and went to work. Because I was able to stand, I had a great view of Clinton. The first thing I really noticed? Hillary Clinton is a great speaker. She is on the same level as Marco Rubio and of course light years ahead of Jeb Bush. She was very skilled in connecting with the audience and telling stories. She drew genuine “ooohhhhs” and “ahhhhhhs” out of the crowd. I couldn’t help but respect it. 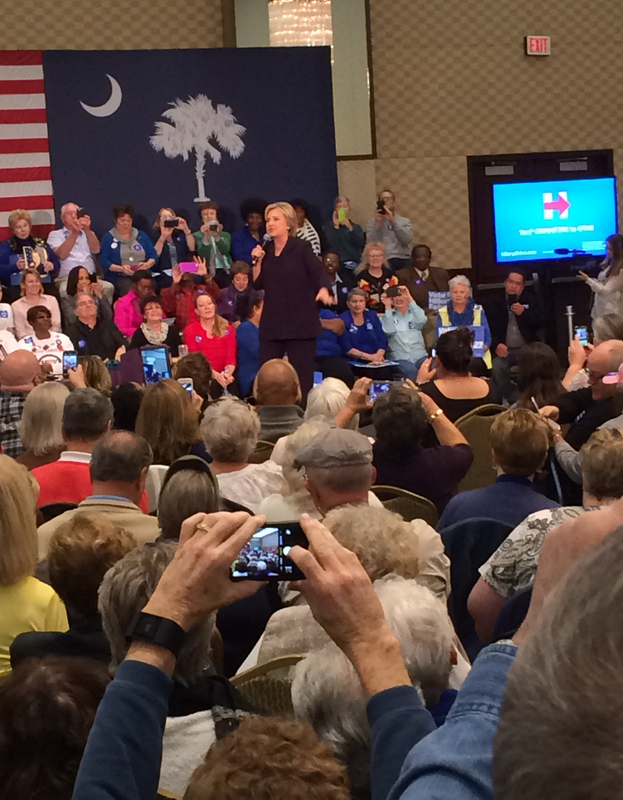 The energy level from both Hillary and the crowd was present. 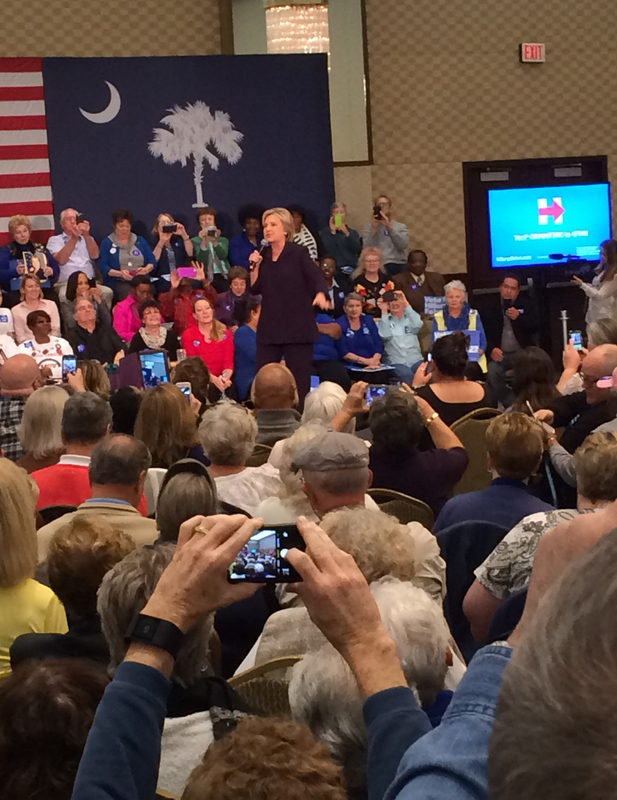 This was the scene last night at the Myrtle Beach Convention Center for the Hillary Clinton rally. I took this panorama right when Hillary started to speak. I had to battle through an adjustment period. After listening to two conservative speakers detail their very conservative ideas it was a little strange listening to a liberal speaker detail her very liberal ideas. But because I am not dead set on the platform of either party, perhaps I took less time to adjust than it might take others. Knowing that she has South Carolina in the bag, she focused most of her negative campaigning on the Republican candidates, basically calling them idiots. However, she did take on Bernie Sanders’ free college education plan and offered a logical critique of it. As someone who works at a university, this was something that was very interesting to me. Hillary touched on many issues and much of it didn’t stick with me just because a lot of it went over my head. But there was absolutely a defining moment for me, a part of the rally that I will always remember. Probably midway through her stump, Clinton brought up the Osama Bin Laden raid. Except for the cell phones that kept going off, the ballroom became very quiet. She described the meeting that was held to approve the mission, the atmosphere inside the war room when the raid went down, the technology that was available to President Obama’s team to view the action, and the kindness that the Navy Seals showed after eliminating Bin Laden (the Seals escorted the women and children out of the compound and placed them in a safe place so that when they destroyed their downed helicopter no one would be injured from the explosion). Hillary making a point during the rally. Of course Clinton used the story to her benefit. Hillary explained that during the meeting when they were deciding whether to order the mission or not, she told President Obama to go through with it. She then mentioned that other people in the room advised him not to go through with it. Probably my favorite part of the rally was watching the Secret Service work. I took this photo after the rally ended. I moved close to the stage and stood on a chair to get a good view of Clinton interacting with the sea of people around her. Within that mob I closely watched and admired her Secret Service contingent. Because I am a United States Presidents buff, I am naturally a Secret Service fan as well. With interest I watched the seven agents who were in clear view perform their job. Three were stationed on Hillary’s right, three were stationed on her left, and one stood directly behind her at all times. When she moved, they moved. Yes yes yes, they all wore suits, ear pieces, and stoic expressions as their eyes scanned in all directions. As I stood on the chair, Hillary fans came up to me and asked if I would snap photos for them with their phones of the candidate. I happily obliged and took about 6-8 photos with each device I was given to make sure the person would have a nice memory from the evening. 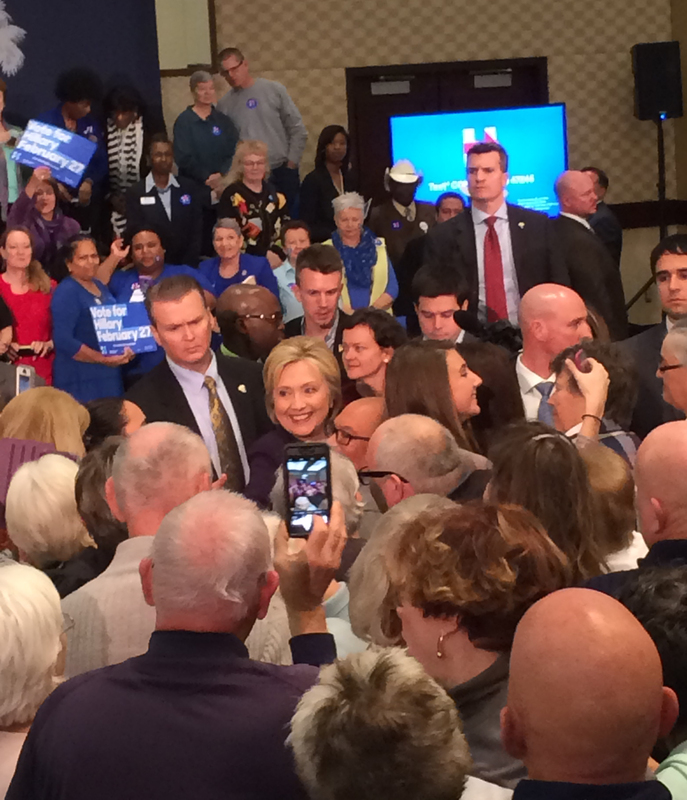 In between serving as a photographer I took my own selfie with Hillary Clinton in plain view. I knew this would be my best shot for a photo op with the former First Lady because I wasn’t going to have the opportunity to meet her. 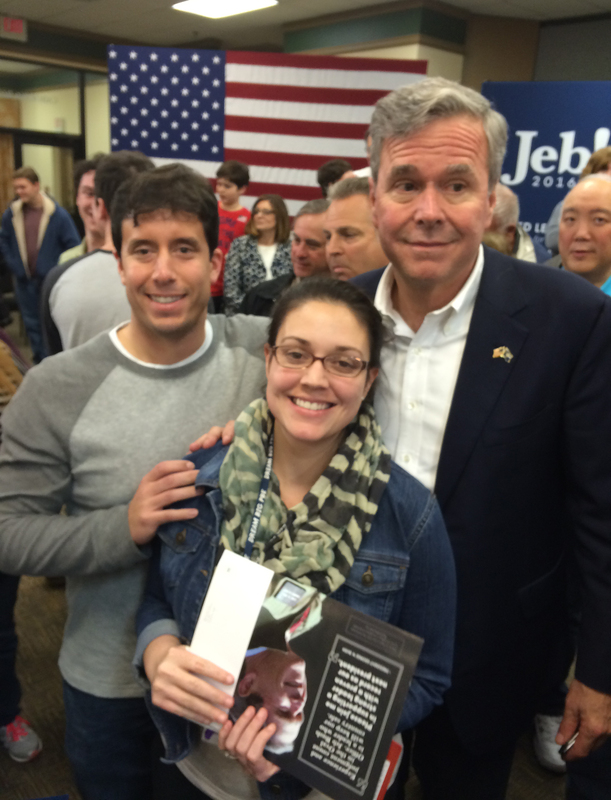 Unfortunately I didn’t get an actual photo like I did with Marco and Jeb…but this will do. Before she exited the venue surrounded by the Secret Service, I was able to push to the very front. Many of the people around me were freaking out, obviously overjoyed to be so close to someone who might be our president in under a year from now. 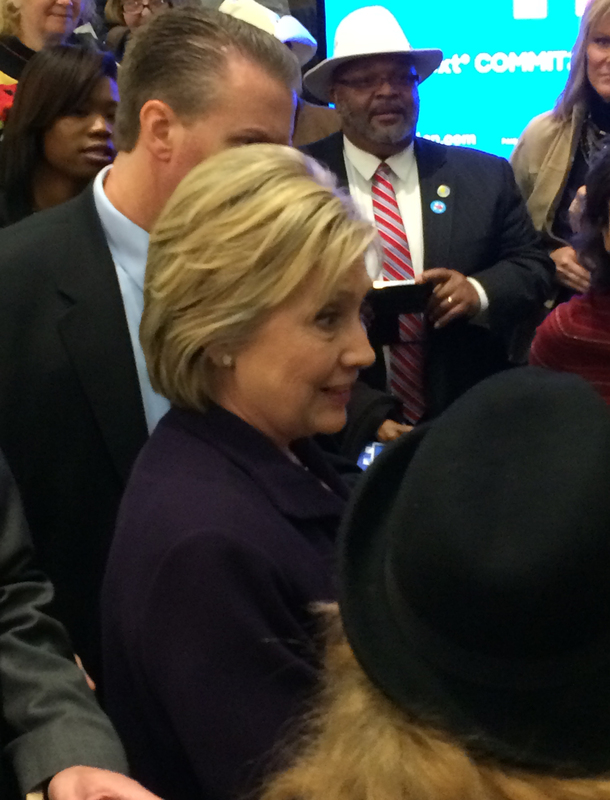 Right before Hillary walked out the door and on to her next campaign stop, I got within feet of her. I feel fortunate that I was able to attend a Hillary Clinton event. Even though I don’t necessarily share her political beliefs (because I don’t have many to begin with) I enjoyed the energy and excitement I could feel. Although I am bummed that I didn’t get to see Donald Trump (he held his rally during work hours) or Bernie Sanders (he didn’t come to Myrtle Beach), I am so happy I took time to watch three presidential candidates speak to me from just feet away. Whatever you feel about politics and politicians, if you have the opportunity to attend an event during this big election year I recommend that you do so. Don’t Blink. Let’s get ready to RUUUUUUMMMMMMBBB….I mean let’s get ready to read my blog! Here we go with my latest Thursday Rundown.. The Battle for the Presidency – This nerd is in euphoria right now with the race for the White House. The twists and turns that have happened each day over the past month have kept me so intrigued and entertained. 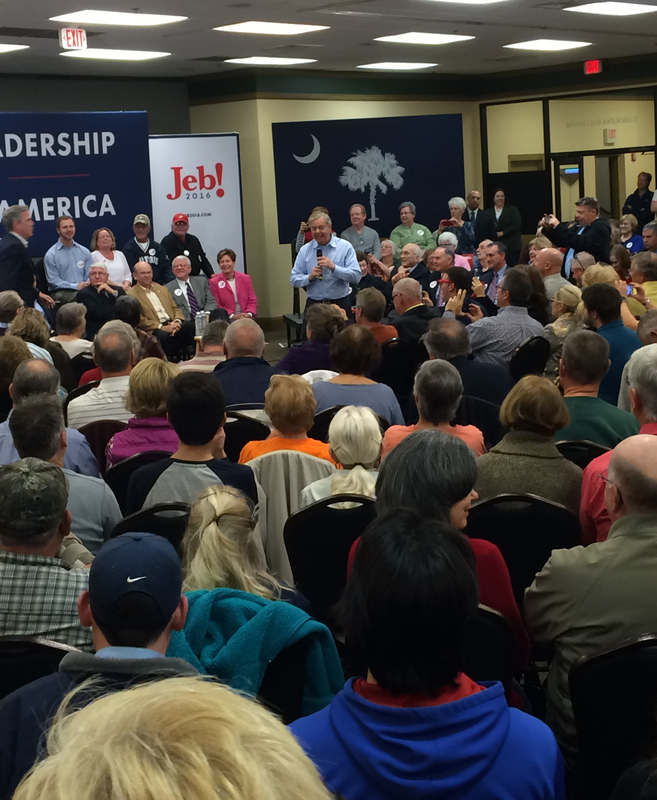 Last week was a lot of fun with South Carolina serving as Ground Zero for the Republican candidates. It was a thrill to watch some of those top politicians in-person. Not to give anything away, but tonight I might have seen a big player from the other side. But more of that tomorrow. I got to watch the big GOP debate now! Baaaaaaad Concerts – Earlier this week, I wrote about the 10 best concerts I have attended in my life. However, when introducing that particular post I also mentioned one of the worst. A friend quickly contacted me to remind me of two other horrendous shows that I unfortunately witnessed. One was a Mike Jones (WHO?!) concert at a small bar in Missoula in May of 2010. Jones showed up a couple hours late and still wasn’t “all there” if you know what I mean. The other was an August 2011 Willie Nelson show at the same Minor League stadium I saw Dierks Bentley perform at. 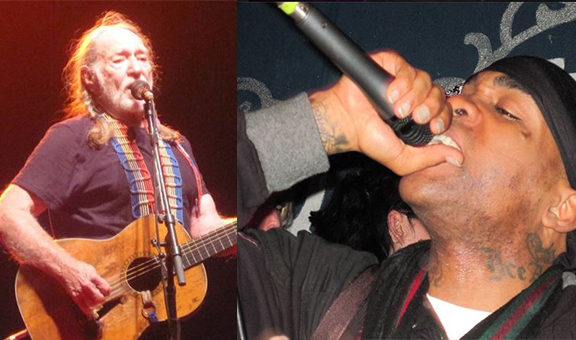 I couldn’t understand a lyric Willie sang and I was bored to tears. “How to Be Single” Review – Sidney and I went to a Sunday evening showing of “How to Be Single.” It is good for a few laughs but I wouldn’t recommend it. The film is another one of those stories that focuses on several individuals for various amounts of time and then has them all come together or connect at the end. Like the other movies I have seen that attempt this formula, it didn’t turn out well. For my female readers, Sidney said she actually liked “How to Be Single” so perhaps you would also find yourselves more entertained than me. 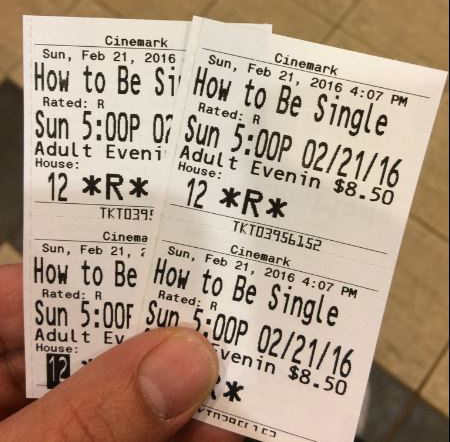 Sidney and I saw “How to Be Single” this past Sunday. False Alarm – Yesterday we braced for a serious storm that wreaked havoc across several southern states. The scary word of “tornado” was thrown into the Myrtle Beach forecast and we all prepared for the worst. In fact, the forecast looked so bleak that the major school district in our area, the one that Sidney is a teacher for, cancelled classes the night before. However, we were spared the brunt of the carnage. We got heavy rain and 50 MPH winds in the morning but all was quiet between 3 p.m. to 6 p.m., the time block when we were supposed to get hit hard. Thank goodness. Wedding Update #21 – Last week I mentioned that Sidney and I received the book to choose our readings/prayers for our wedding. This week we actually chose them. You see, in this book you have around 6-10 different bible passages or prayers to choose from for each reading or blessing that makes up a Catholic wedding service. The two of us decided to review the options individually and then mark down our two top choices on a separate piece of paper. We then compared our selections. For pretty much every one, we overlapped with one of our choices! It seems like I am only good at saying this on Thursdays but thank you for your readership. My analytics say that people have a craving for silly, pointless writing because 2016 is on pace to crush the total views from 2015 (the top year in the history of Don’t Blink). I am appreciative. Don’t Blink. I sound like a broken record because I have touched on the subject so many times but it is true: social media is constantly changing. Some people resist it and some people embrace it. Because of my profession, I am definitely one who embraces it. However, today I went a step further and tried to make others embrace it as well. You can also “Haha,” “Wow,” “Sad,” or “Angry” any piece of content you want. By doing any of these actions, an emoticon face displaying the thought/emotion will also appear right beneath the post. It is pretty cool! If you hover over the “like” button, you now have five additional options to choose from. Let me say this: Facebook needed to do this. The social media giant went a whole decade without any modernization of content response; it was always just “comment” or “like.” As Facebook posting capabilities evolved, there weren’t any reaction tools added to keep up. For far too long if you wanted to recognize a Facebook friend’s status when he/she wrote that a loved one passed away or that he/she would be moving across the country, all you could do was “comment” or “like”. Many times both of those options are inappropriate. This issue is now solved. When I saw the improvement this morning I wanted to celebrate. But I held it all in and waited for tonight! This evening I took it upon myself to spread the good news. I went on a “Hahaing,” “Wowing,” “Angrying(? ),” etc. rampage. It didn’t matter who it was, I went down my newsfeed and performed one of the new Facebook actions to every piece of content that Facebook fed me. After I exhausted my newsfeed, I just started typing in names of friends. I went to their page and made sure to “haha” a photo or “wow” a status. Even if it meant I had to mark a buddy’s video from a year ago with “angry” I did it. I probably performed at least one type of the new Facebook actions on 60 people. Why did I do this? Like I said, I wanted to help people embrace the new Facebook invention. It never fails, some people will always hate change, even if it is a significant improvement. 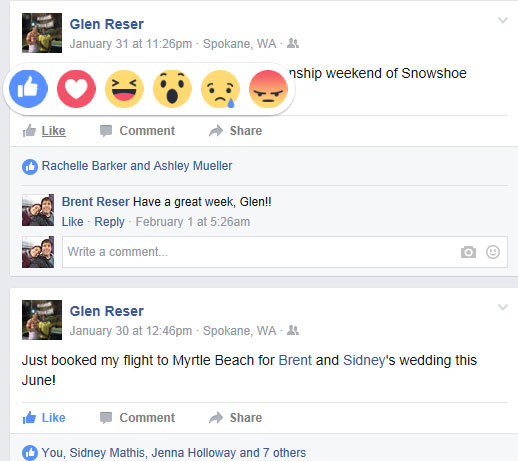 Maybe someone who thought this rollout was dumb changed their tune when they were notified that Brent Reser “Wowed” their relationship status. Of course I did it as a method of awareness too. I guarantee half of the people who received a notification from me today didn’t even know about the change. Perhaps by me “hahaing” them or “angrying” them for the first time it helped them get with the program and not feel so out of the loop. You’re welcome. Bravo to Facebook for this long overdue change. I hope all my Facebook friends go crazy with the new feature like I did. Don’t Blink. Yesterday I checked my Timehop and was reminded of a concert I attended three years ago. On a late February evening in Montana, I watched a show that was headlined by T-Pain and the Gym Class Heroes. The odd pairing led to an odd concert. Needless to say, I didn’t necessarily have fond memories when I was reminded about it yesterday morning. 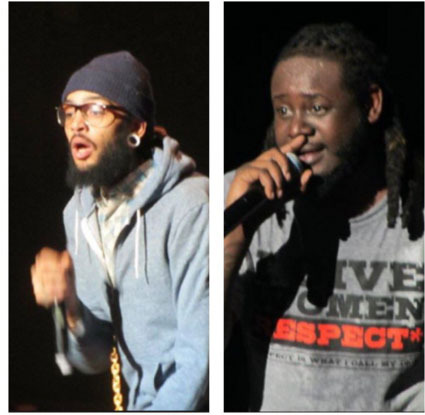 Photos I took of Travie McCoy and T-Pain three years ago in Missoula…I was not impressed. I used to attend a lot of concerts. Some fell into the category of T-Pain/Gym Class Heroes but others were actually enjoyable. This evening I want to give you the top ten concerts I have attended. Although Darius Rucker didn’t use a lot of technology, pyros, and strobe lights in his show, it was cool watch him perform in his home state. The people at that concert were die-hard Darius fans and the passion was definitely there. Helping make the concert even better was that I got to appear in his music video for “Homegrown Honey” earlier that afternoon. You always remember your first concert! 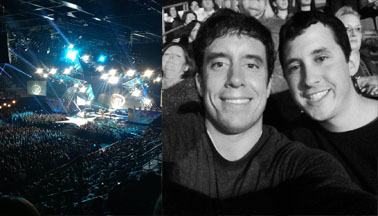 I went with my brother and sister to a Brad Paisley show that happened to have three opening acts. While Jack Ingram and Kellie Pickler are no slouches, who knew at the time that Taylor Swift would grow up to be the most famous entertainer on the planet? I still remember after the show she signed autographs on the concourse of the arena and I couldn’t help but think that not only did she look so young but she also looked really genuinely happy. 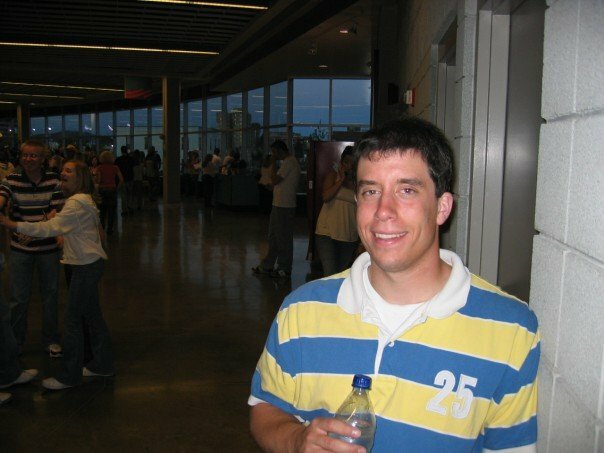 This is me in 2007 in the Spokane Arena concourse between sets of my first ever concert. My friend Nick and I drove after work from Missoula to Spokane to watch this one. We had great seats and even though I am not a Little Big Town fan, Urban flat out performed. His stage was insane and the way he played that guitar was incredible. I remember him taking out a tennis racket and hitting balls far up into the seats. It was a cool experience. I include this on my list for a few of reasons. 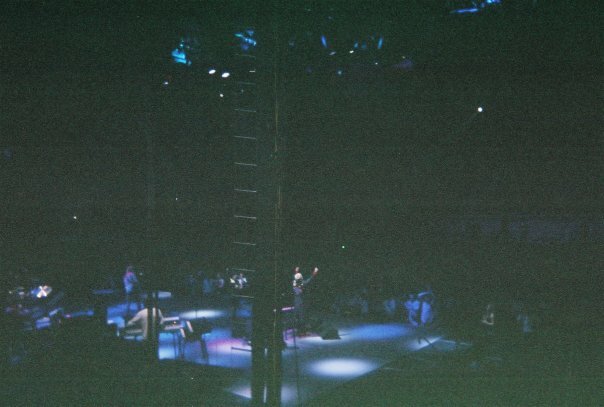 To start off, it was the first concert that I ever went to where I had incredible seats. Before this, I watched shows from the third deck. To be on the floor and actually watch the performers on the stage instead of on the video board gave me a thrill. I was also a huge Rodney Atkins fan at the time (“These Are My People” was my anthem). Lastly, my brother had come to visit me and let’s just say we had a really good time before and during the concert! I have seen Dierks Bentley three times in concert but the first time was definitely the best. My friend Dan and I saw him on Independence Day in a Minor League baseball stadium. The crowd was fun and the setting perfect. I imagine Dierks would have liked to be anywhere but that ballpark on July 4 but he gave a great effort. The fireworks show afterwards was a nice touch. 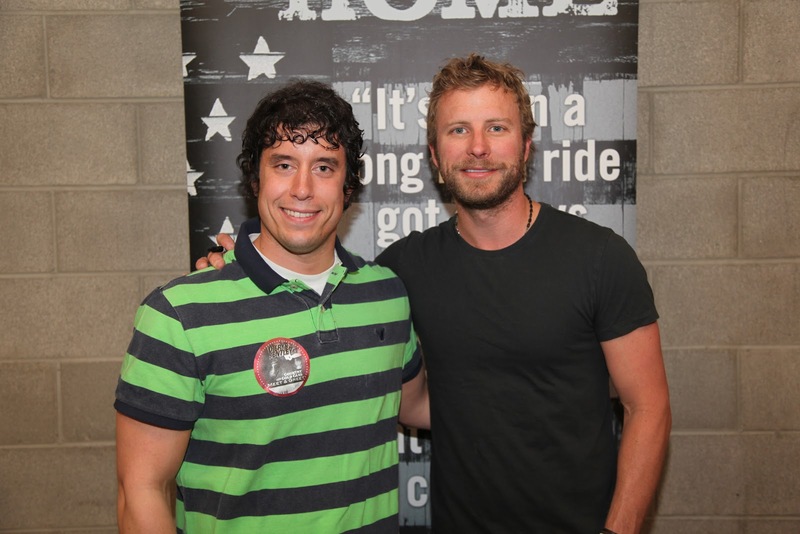 I have seen Dierks in concert a couple times and even met him. However, the first time was the best. I had to include the two concerts Dan and I saw together in one spot on the countdown. Almost two years after seeing Dierks in the stadium, we watched Gary Allan and Jack Ingram in the Adams Center. This show was special because it completed a progression. I went from nosebleeds in 2007 to stage level in 2008 to front row in 2010. This was my first concert up front and the energy was incredible. Dan and I had a great time slapping hands with the performers and I could tell you that I never wanted to be anywhere else but front row after that. The left photo shows how close we were. This was taken by my camera without zoom. The right image is Dan and I.
Tim McGraw is a country music superstar that is known for terrific shows. At this time, Lady Antebellum had already established themselves as one of the genre’s best groups. I was seated on the floor right near the stage. Lady A did great and then Tim McGraw had one of the coolest entrances I have ever seen at a concert. During one song he went into the crowd and I managed to shake his hand. I wish Hillary Scott was looking when I took this photo! As for the other image, this was right before Tim McGraw shook my hand. 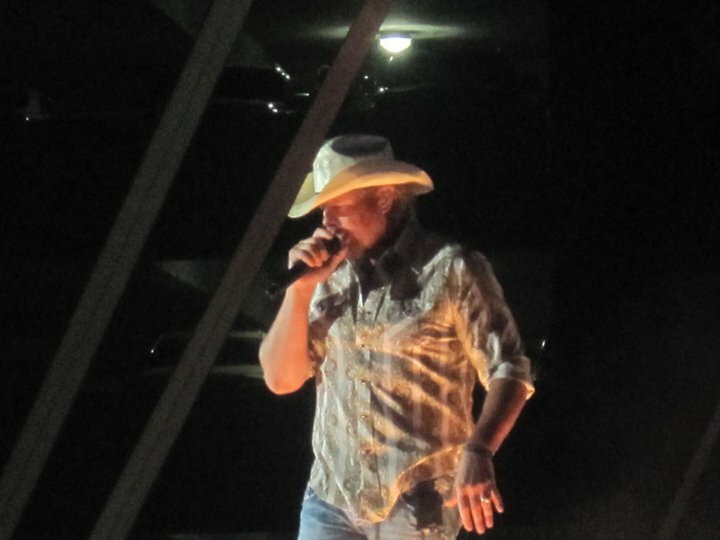 If there was one country performer I needed to see in concert to fulfill a bucket list item, it was Toby Keith. To be honest, I really started liking country because of Keith. His concerts are legendary and the fact that this one was outdoors made it an opportunity that I couldn’t pass up. My boss at the time and I were in Coeur d’Alene, Idaho, for a Spirit Squad camp (our University of Montana cheer squad and dance team were competing). When the day’s events concluded, my brother came across state borders and picked us up. The concert was great and Toby was as good as advertised. Afterwards we met him in the casino! Rather grainy photo of Toby but I did my best. What is better than watching a couple of your favorite country stars perform? Seeing a whole bunch of your favorite country stars perform! Such was the opportunity my brother and I had a few years ago when we were vacationing in Vegas. It just so happened that the American Country Awards were taking place during the duration of our stay. The night of the show, I made an impulsive decision and purchased tickets. Of course I wanted to watch the best in country music perform and get recognized but I also really wanted to see how an awards show works when you aren’t watching it on TV! We had a great time in the pristine Mandalay Bay arena watching Trace Adkins host, stars perform, and celebrities present awards. An awards show like the ACAs is something everybody should treat themselves to at least once. We were up high but we had a great time. Brothers!! I am an extreme Elton John fan. Name one of his songs and I can recite every lyric for you…seriously. The fact that a superstar like him would come play a concert in Montana of all places was absolutely crazy. After standing in line forever on a couple different occasions, I scored tickets. I watched him from bleachers behind the stage but it didn’t matter…I was in the presence of greatness. To this day, I haven’t watched a live show of anyone of greater stature than Sir Elton. This is all I can give you….a dark, grainy, far away shot. Despite the bad seats and my terrible camera it was an awesome show. 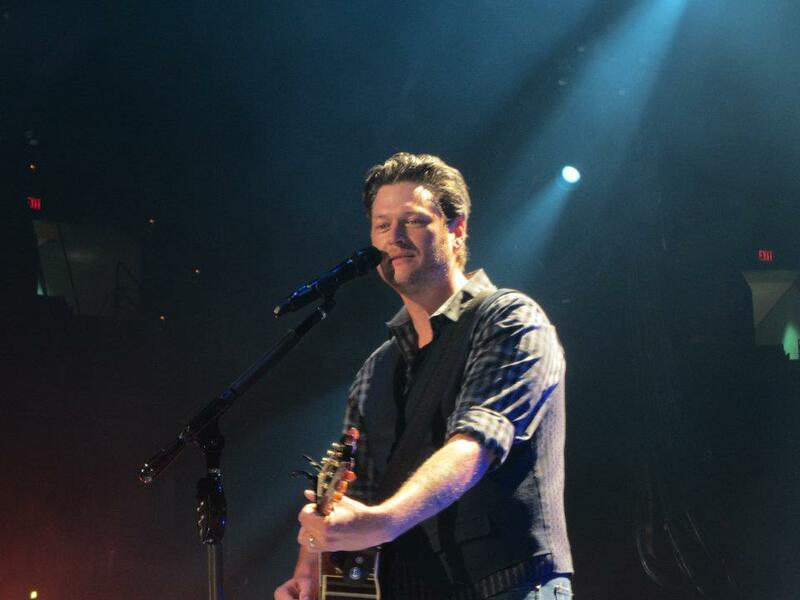 If you read my blog, you know I am a major Blake Shelton fan. His songs consistently appear on my “Brent’s Top Songs of ________ (whatever year)” and I praise him often. I had the privilege of watching him from the very front row in a sold out arena in 2012. One word: entertainer. He was funny, he was talented, he was involved. He put on the best show I have ever seen from a musical artist and I got to see it all up close. It was an honor and I will never forget it. A photo I took of Blake Shelton where the zoom function wasn’t necessary. As you can see, I have witnessed some great shows. However, I have seen many other concerts such as the one mentioned at the start of this blog post. When it all comes down to it, I would still say I have enjoyed more of the good than the bad. I don’t go to many concerts anymore but if the opportunity ever presents itself in the future you can bet that I am down. Don’t Blink. For most people, going out to eat is fun. Many different components make dining at a restaurant enjoyable. Besides waiters who wear flair, walls/ceilings covered in memorabilia, and white paper table cloths that you can color on, there is something else that enhances the restaurant experience: that complimentary item served right when you sit down. Mexican restaurants serve chips and salsa, Italian restaurants pass out baskets of garlic bread, American pubs slam down buckets of peanuts at the end of the table. Down here in the South, seafood restaurants offer delicious hushpuppies. These tasty snacks served the moment you sit down scream VALUE and FUN. Who doesn’t like eating something that is yummy and essentially free? Who doesn’t like scooping salsa with a chip or throwing peanut shells on the floor? When it comes to my thought process, if I have to choose between two restaurants, I am going to select the place that gives us something just for sitting down in a booth. So what about those other restaurants that don’t treat customers to piping hot bread or egg drop soup just for showing up? I will give them the benefit of the doubt and say they don’t participate because of the cost. I am sure most businesses want to make a profit. But what if there was another reason? Perhaps some restaurants just don’t know what an acceptable food item is to dish out while people browse the menu. I thought it would be fun to offer five ideas! * BACON – If you want to save time, just stop reading now because this is the best idea I got. Why hasn’t any restaurant done this yet? A party sits down at a table and immediately a sizzling plate of bacon is put right in the middle of everyone. Not only is this an affordable option but it hits right at the most popular food obsession in our country. Honestly, this is an idea for a major well-known casual restaurant chain to take over and exploit! How cool would it be if you were delivered a tray of fresh Washington apples with caramel and peanut butter dipping sauces? Talk about something that would distinguish your business. This is such an original and fun idea. Best part is, most businesses could afford apples for days. Applebees….I am thinking of you. * Silver Dollar Pancakes – When you go out for breakfast, you rarely expect any type of free appetizer to be brought to your table. I am calling on any breakfast house in the nation to step up and change this (and I will give you the idea too). I think it would be genius for a restaurant such as IHOP, Denny’s, or even one of the hundreds of breakfast places in Myrtle Beach to offer silver dollar pancakes to all customers. Not only would this be a great way to start the day, it would also allow folks to sample the different syrups that most of these places offer. Again, this is all about being fun and creative! * Cheese Puffs – Mexican restaurants have the monopoly on tortilla chips so your average American restaurant probably wants to do something a little different. My big idea is to convince a diner or casual chain to offer homemade cheese puffs the moment customers sit down. They would make these in-house and they would come out warm. Cheese puffs are easy to eat and would be perfect to snack on while you customers wait to put in their food order. I would double down that there isn’t one restaurant on the planet that has thought about this yet. Sure some restaurant furnishings might become orange-stained but I think it would be worth it. * Bubble Gum – I am rolling over laughing with these ideas! I am advocating the offering of BUBBLE GUM at restaurants as a way to deter those people who don’t want to eat free snacks or appetizers prior to their meal. Restaurants would offer big gobs of gum in addition to a legitimate snack in the middle of the table. If you want to munch and enjoy yourself, then take the apple slice or piece of bacon. If you want to resist temptation and not ruin your dinner, then pop in a piece of gum and blow bubbles. Of course the gum would have to come in different bold flavors and be covered in a wrapper with the restaurant’s branding. Even if you don’t like these specific ideas I put forth, can you at least agree that we need dialogue on how we can liven up the standard chips and garlic bread options? Please, give me your feedback…but pass the bacon first. Don’t Blink. It is safe to say that Sidney has led me to watch several television shows I never would have watched without her influence. The Mindy Project, Big Brother, and The People’s Couch are all such examples. Because of my exposure to these shows, I have actually gone on to like a couple of them. Besides those programs though, did you know there is a whole genre on television that Sidney has completely opened my eyes to? No, it is not reality TV. I have come to like cooking shows! Yes, this statement is coming from a guy who doesn’t cook (usually). Full transparency here, I have a tough enough time boiling water. But despite my ineptness in the kitchen and my lack of desire to ever watch a cooking show before I met Sidney, I have started to come around. Quite frequently, Sidney and I will watch The Pioneer Woman and Trisha’s Southern Kitchen. These shows have grown to make up a large part of our weekend television schedule. Of course I didn’t like these programs right away. I constantly wondered aloud to Sidney on why they always had to incorporate some cheesy story to go along with whatever meal Ree Drummond or Trisha Yearwood cooked up. The scripted nature of whipping together a feast for the kids as they built a tree house or making a power lunch for Garth and his buddies turned me off a little bit. I also drove Sidney crazy questioning why the Pioneer Woman needed to wear that mile wide smile for the entire show. She could have burnt herself on the stove or accidentally cut off her finger and she still would have that grin spread across her face. But these shows started to win me over. There is just something about watching fresh food ingredients transformed into mouth watering dishes right before your eyes. As one might expect, the end product never turn out bad. The best part about the cooking shows Sidney and I watch is that we are observing the development of meals that we would actually want to eat! Ree and Trisha don’t make gourmet, hoity-toity plates. Rather, they make comfort food! Instead of watching them make caviar or exotic salads with herbs/stems, we watch them make pastas, sandwiches, casseroles, and desserts! It just isn’t watching the making of these meals either. One of the best parts is listening to the sounds. It seems like the cutting of bread or the breaking of fresh lettuce or the grating of a block of cheese is amplified. I could close my eyes and still be entertained throughout the program. Even though I couldn’t cook myself out of a paper bag, when Sidney and I watch these shows we discuss what looks especially good. We might offer a suggestion here and there. It is an open dialogue throughout the program that is actually really enjoyable. As I have mentioned more than once in this blog, Sid is a terrific cook, and she learns from the best. Besides her mom, Sidney has also taken inspiration from Ree and Trisha to make masterpieces in the kitchen. If you start to watch these shows because you read this blog post, let me give you one big tip: watch them when you are hungry! It will make your time in front of the TV even more enjoyable. My fiancé and I will continue to watch and maybe one of these days you might see Sid herself on the Food Network with her own show. Expect to learn about her famous chicken bog, mac & cheese, and buttered noodles. Don’t Blink. 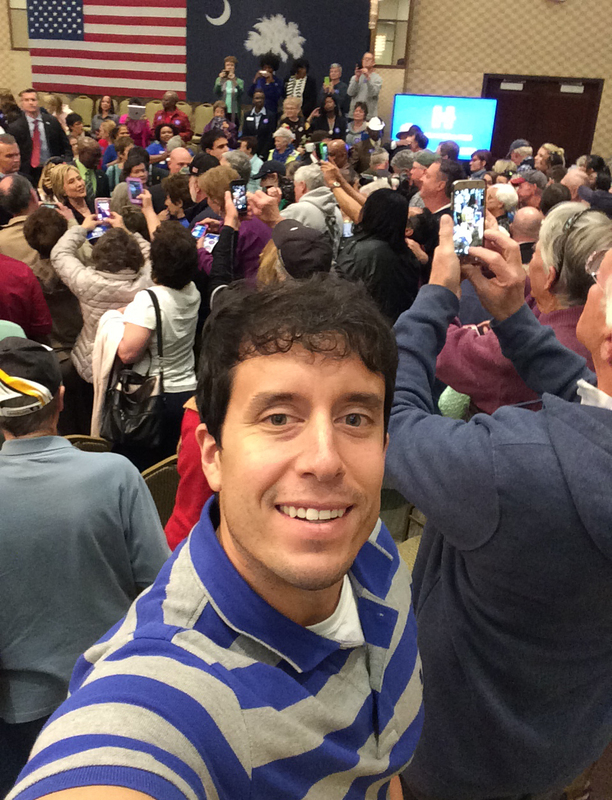 On Tuesday evening I wrote about attending a Marco Rubio rally. I explained that I showed up for the experience, not the politics. I had the opportunity to see how a political rally is conducted, listen to some naturally great speakers, and meet Senator Rubio himself. It was a good evening. Partaking in the 2016 South Carolina presidential primary madness that night was interesting. In fact, it was so interesting that I was hungry for more. 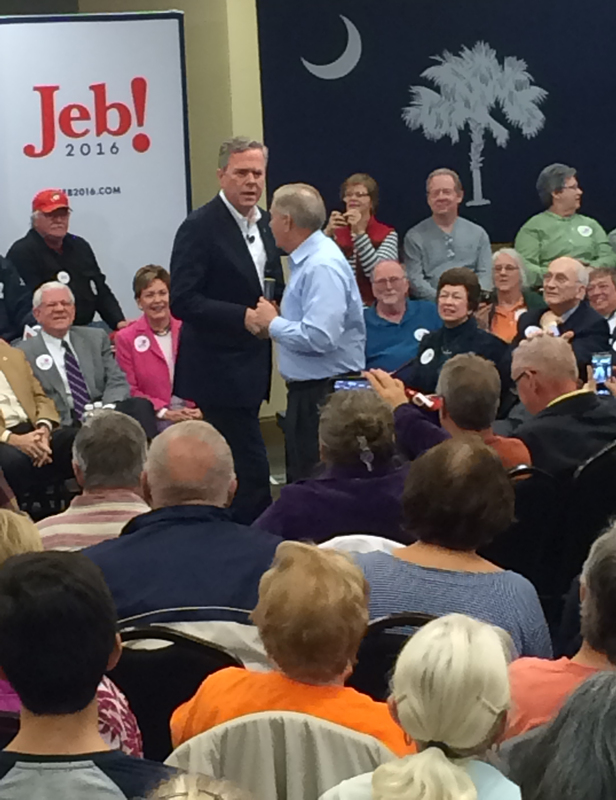 So, naturally, I attended the Jeb Bush rally here in Myrtle Beach the very next evening. 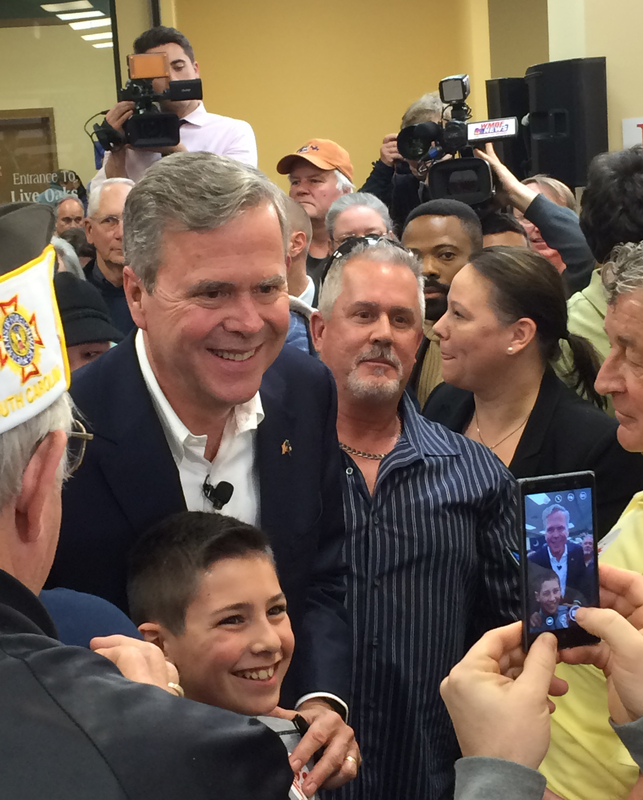 On Wednesday night, Sidney and I went to a town hall for Jeb Bush. I took this panorama a few minutes after Jeb took the stage. Look, I know Jeb Bush has had a rough go with his campaign. He was expected to steamroll his way to the nomination only to embarrassingly underperform. The amount of money he has spent and the lack of results he has achieved is well-documented. Donald Trump has ruined the poor guy, labeling him as “low energy” and taking out his social media ire on him. In a last ditch effort to change his image, Jeb has recently stopped wearing glasses. He is still far behind in the South Carolina polls. So, why would I attend a political rally for Jeb Bush, someone who clearly isn’t going places? 1. I literally live five minutes away from where Jeb spoke. 2. I was holding out hope that his brother would speak. With Jeb speaking at the Springmaid Beach Resort (the location I go to all the time when I visit the beach), it was a short drive to attend. Also, the realistic hope that George W. Bush might introduce his brother, like he did in Charleston on Monday, was a great motivator. I have never had the privilege of listening to a President of the United States speak before so it would have been a huge bucket list item for me (I have a thing for U.S. Presidents). Well, at least the drive was brief as advertised. Although I didn’t get to see a former U.S. President speak, I did get to see another U.S. Senator say a few words. Senator Lindsey Graham, a guy who was also a presidential candidate, introduced Jeb. It was neat to see the other senator speak after I listened to Tim Scott on Wednesday. Unfortunately Graham’s speech didn’t go as smoothly. Lindsey Graham addressing the crowd. First off, he didn’t speak until around 6:50 p.m. (the event was supposed to start at 6:30 p.m.). Senator Graham and a couple other people took the stage randomly to no fanfare. You could tell Graham was tired as he spoke. In a bizarre moment right in the middle of a sentence, Jeb Bush poked his head out from the dividers serving as the backdrop and strolled out. It caught Senator Graham by surprise and he reacted by quickly turning it over to Jeb. Senator Lindsey Graham turning it over to Jeb Bush. But after about 20 minutes, Jeb got a little better. We were in a hotel conference room, probably half the size as the Rubio venue and with half as many people. But it was full and Bush was surrounded with supporters. Something clicked and he finished his stump on a better note than what he started it on. When his speech ended, the charismatic side of Jeb Bush came out as he started taking questions from the audience (the event was billed as a town hall). Even though he never really answered completely the questions of the people he called on, he seemed to connect with each one. He was just very likeable, something I had not seen at the debates. 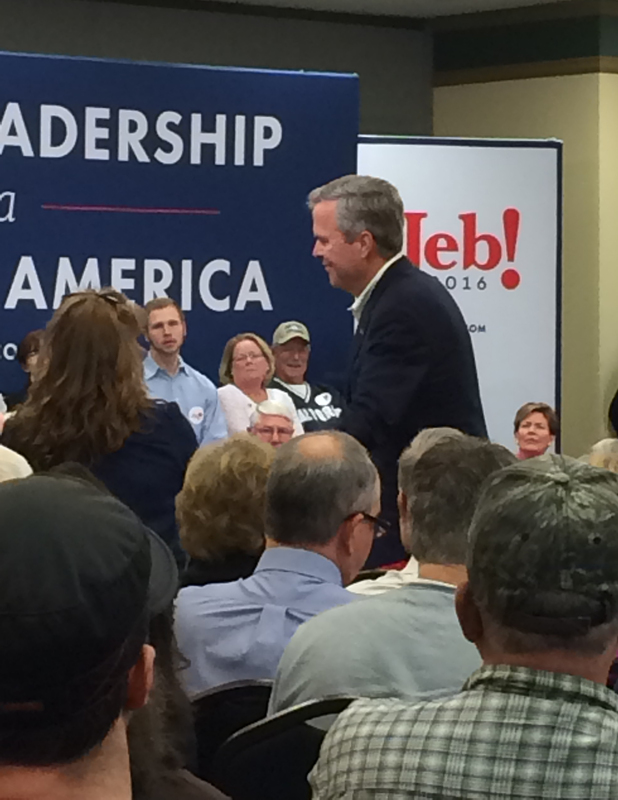 Jeb listening to a question from the audience. During most of the speech and through half of the Q&A, Sidney was looking at her phone. Believe it or not, she was reading Jeb’s platform, specifically his education policies. After about five questions, Sid nudged me and said she was going to ask a question!! She was passed over twice as she half raised her hand. After that second attempt to grab his attention, one of Bush’s aides said it was time to conclude the event. Bush interjected and said he would take a few more questions. Sure enough, right after he finished answering what was supposed to be the last question, he called on Sidney!! A nervous Sid looked behind her to see if Jeb meant to call on someone else. She then looked at him to clarify that he had called on her. The microphone came to Sid and she graciously thanked Jeb for taking her question. She then asked the one thing that is on every teacher’s mind. The crowd erupted! (**I am not going to get into the dialogue in this post, but you better believe I had my phone out when she asked her question. You can watch Sid ask it and hear half of Jeb’s response by clicking here). Although Jeb never really fully answered Sid’s question he did earn my respect. Not only did he treat Sid well, he also proved that the questions asked in his town halls are authentic. I always wondered if the people asking the questions were planted. A photo I took of Jeb after the event. As the event concluded, Sid and I approached the stage. She wanted to thank Jeb for answering (or attempting to) her question. Compared to the Marco Rubio rally, the post event huddle around the candidate was chaos. Whereas Rubio had rope stanchions that gave him space and folks ample room to take photos, Jeb was mobbed with no protection. We did make it up to him but I think the photo describes what type of a scene it was. Here we are with Jeb. The event, and Jeb himself, were a little disorganized. 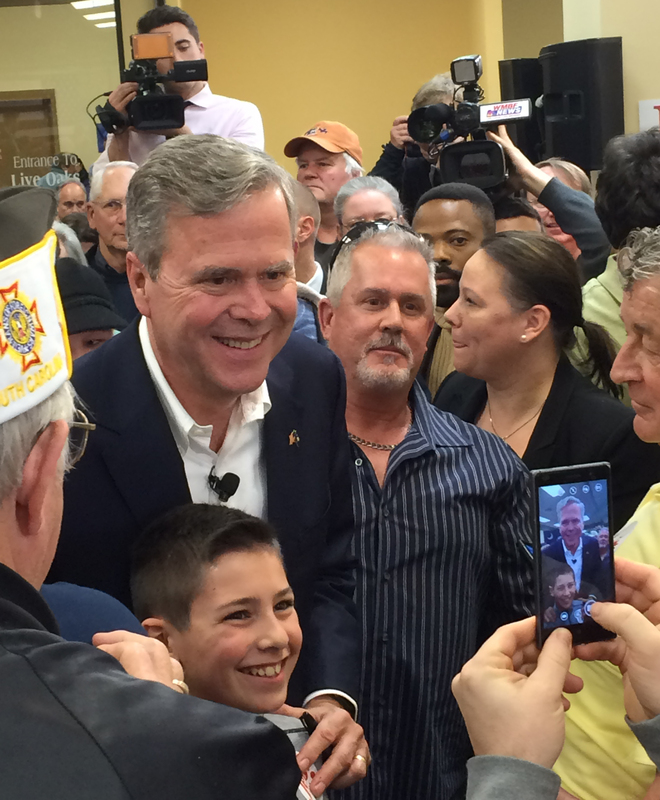 There definitely wasn’t the energy at the Bush town hall like there was at the Rubio rally. However, watching Sidney ask that question and hearing the crowd react to it was an awesome moment. We might not have listened to the next President of the United States on Wednesday night but we were treated to another experience I never thought I would have. Don’t Blink.